Multi Maze intake air filter/filter silencers offer oil-wetted wire mesh of dry pleated paper media with 400-6,000 CFM capacity. Impingement principles provide up to 96% arrestment on harmful dirt particles 10 microns or larger on the oil wetted models, the dry paper models will achieve 99% arrestment on particles 5 microns or larger. Pressure drop across a clean filter element is less than .25” WG. Depending on connection size, total loss across a complete unit is generally less than 3” WG. and is only slightly higher in the BWM type filters-silencer models. Type MU filter silencers provide attenuation in the frequency ranges where noise levels of reciprocating compressors and engines are most objectionable. The BW models with additional acoustical components, were specifically designed for installation to lobe type compressors and centrifugal blowers. For specific information refer to the chart below. 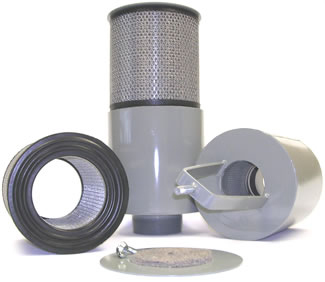 Relatively lightweight, Multimaze filters and filter-silencers can be supported directly on the air intake. The wire mesh filter element is of crimped galvanized screen cloth which becomes progressively denser. This results in greater dirt holding capacity, thus reducing service frequency intervals. Media will not pack down or channel due to vibration. The pleated-paper element is of pleated construction and employs a protective outer wrap to prevent damage to pleats. Optional weather hoods are available on all models. Finish is grey enamel. Refer to the table on the opposite page. Capacities indicated are for constant flow. Unscrew wing nut and remove element. Wire mesh models require washing the element in a commercial cleaning detergent. Recharge with SAE 30 oil. Allow unit to drain prior to placing back in service. The pleated- paper element is usually considered a disposable. The silencer chambers of the silenced models require no attention during servicing. DO NOT USE GASOLINE FOR AN ACCEPTABLE CLEANING FLUID!